How To Improve Yourself explains the processes and responsibilites of growing and maturing as a leader. Perfection is what you're striving for, but perfection is an impossibility. However, striving for perfection is not an impossibility. Do the best you can under the conditions that exist. That is what counts (John Wooden). Learn as if you were to live forever; live as if you were to die tomorrow (Anonymous). Jorma Ollila was a young CEO who led a very successful company. His motto was this: "This is an organization where, if you want to prove yourself, if you want to develop yourself, and grow yourself, we will give you the platform." John Maxwell states: "We live in a society with destination disease. Too many people want to do enough to arrive, and then they want to retire." Kevin Myers explains: "Everyone is looking for a quick fix, but what they really need is fitness. People who look for fixes stop doing what's right when pressure is relieved. People who pursue fitness do what they should no matter what the circumstances are." In other words, when we do the hard yards, the result is that we are self-improving. People who are constantly improving their performance usually make three processes an ongoing practice in their lives. As the adage goes, "Fail to prepare, prepare to fail." As John Maxwell states: "Self-improving team players think about how they can improve today - not some far-off time in the future. When they get up in the morning, they ask themselves, what are my potential learning moments today? Then they try to seize those moments. At the end of the day, they ask themselves, what have I learned today that I need to learn more about tomorrow? By doing this you put yourself in a position of continually growing on a daily basis. When you are constantly growing, you are better prepared to handle the challenges that you will face in life. 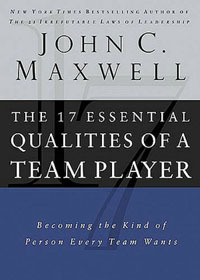 John Maxwell writes, "If you study the lives of the truly great individuals who have influenced the world, you will find that in virtually every case, they spent considerable amounts of time alone - contemplating, meditating, and listening." In other words, to improve yourself you need to spend some time alone. It give you time to gain a better understanding of what is happening around you. It enables you to gain a better perspective of your failures and successes. It will help you to plan out and improve your future. Application is simply applying what you have learned in the course of your self-improving. This may require some changes in your life. John Maxwell writes, "Most people change only when one of three things happens: they hurt enough that they have to, they learn enough that they want to, or they receive enough that they are able to." In light of this, you need to continually learn so that you want to change for the better every day. To become self-improving, you need to become highly teachable. You need to put yourself in learning role whenever possible. Take time to listen. Tackle a new discipline. Adopt an attitude of learner rather than an expert. To become self-improving, you need to plan your progress. Pick an area that you want to improve in. Read a few books on the subject and find learning moments whenever you can every day. To become self-improving, you need to value self-improvement above self-promotion. John Maxwell sums this up by stating it this way: "Make your next career move based on how it will improve you personally rather than how it will enhance you financially." For more information about this subject, click on how to improve yourself.